Two stories in the news that are like duh!!! 1. Tanning causes skin cancer? Are you kidding me? 2. The southern legal system is racially asymmetrical. Do we need to conduct studies and spend tons of money researching the obvious? Should we make laws to prevent underage tanning booth use or excessive use across the board? OR is this simply a case of caveat emptor. The question that really needs to be asked is how do the eight southern states studied in #2 compare to the rest of the country? My worry is that they aren’t the outliers those of us in the “liberal north” would hope they are/were. I had a friend I worked with while landscaping in Connecticut when I was a kid named Eddie Brown and he was (is?) a black man from South Carolina. Anyway I remember asking him if racism was worse in the north or the south. He immediately said it was worse in the north, because at least in the south everyone knew where everyone stood. As he said “Our women didn’t sleep with their men and we didn’t sleep with their women.” However, in the north as he pointed out he was put off by the fact that when I or others he worked with asked a customer if we could use their bathroom they said absolutely, but when he asked there was an ever so slight hesitation and even when obliged he was “monitored” as he put it. So, my point is that we rip on the south and deservedly so in many instances, but as we are seeing with the couched criticism of President Obama from all over the country there is latent racism everywhere and it will not be resolved if we continue to pillory the south while not looking in our own bathroom mirrors. What have we learned from the H1N1 scare? Well we have learned that fear grips even the most rational of human beings when they are bombarded with scare campaigns not seen since the days following 9-11. I suspect that much of this fear was ginned up by the Pharmaceutical Industrial Complex (PIC). How can I make such a dark accusation? 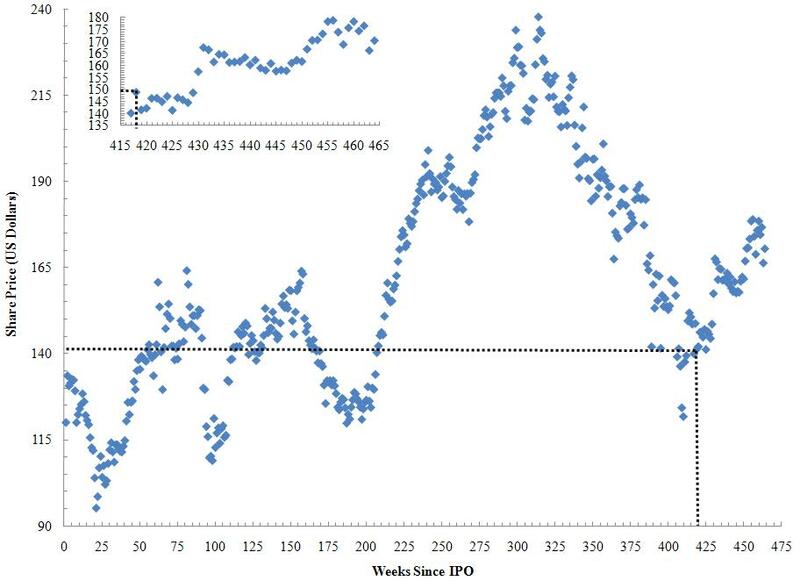 Let us look at the movement of Roche’s share prices before and after H1N1 was discovered. Roche happens to be the predominant maker of H1N1 vaccine commonly called Tamiflu. They are based in Switzerland and trade on the Swiss Exchange. The graph below depicts shares of Roche in current US dollars (i.e. 1 Us Dollar = 0.9437 Swoss Framcs). 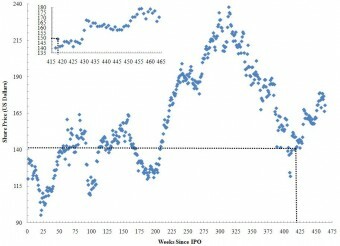 The perforated lines in the main graph and inset pinpoint the week of April 27th, 2009, which is commonly used as the starting point of the “pandemic”. The inset is simply the aforementioned week to the present blown up to highlight the post-H1N1 trend for Roche’s shareholders. I am not proclaiming some sort of grand conspiracy, but what I am pointing out is that there clearly was a financial incentive for Roche to perpetuate the global tamiflu campaign given their near monopoly on the vaccine (Note: This is the kind of thing that antitrust advocates have been screaming about for decades). Roche’s share price had reached lows not seen since November of 2004 in the month prior to the H1N1 outbreak, but curiously enough many investors were prescient in going overweight Roche in the weeks leading up to the outbreak raising the share price from the previously mentioned five year low of $121.81 to 140.04 in the week that preceded the 1,400 suspected cases reported in Mexico (i.e., April 2oth, 2009). To put it more succinctly shares of Roche have gained 142% between the IPO in May of 2001 and March 5th, 2010 (116 Months). Yet, they only gained 117% between the IPO and the week prior to the H1N1 outbreak (104 Months). In the forty-seven weeks since the April 26th, 2009 outbreak shares of Roche have gained 122% rising from $140.04 to 170.52. That is quite a turn of events for a company that seemed to be floundering and it is also quite the investment for those investors I mentioned earlier that went long Roche in the month prior to the “pandemic” as they have accrued an average return of 140%. There is one more point to dovetail with the apparent windfall profits generated for one business in a time of near global panic and that is the data used to generate said panic. The data above describe the total number of H1N1 cases globally as of calendar year 2009-2010. The data represents 28% of the world’s 195 countries, 81 and 94% of the reported Cases and Deaths, 72% of the world’s population, and 58% of the world’s births per annum (h1n1). From this table we see that the phrase “much ado about nothing” – either the Shakespeare comedy or Kenneth Branagh flick – doesn’t do justice to this supposed global scare. The Average-Median Case and Total Death Range was 5,798-52,804 and 132-601, respectively, with totals of 1,326,367 and 16,264. However, the percent of cases that resulted in death globally was 1.10% with an Average-Median range of 2.47-6.83%. I assume this number is one that Roche will take all the credit for and will likewise brush aside the accusation that the panic was at the very least overblown and more likely generated to save a stale and passed-it’s-prime pharmaceutical company. So some will say and rightly so that I am being completely insensitive to those that lost loved ones during the H1N1 outbreak. I would simply say that I am not insensitive but simply pointing out the fact that a very small sector of the world benefited greatly from your loss (i.e., Roche Shareholders) and that unfortunately people do die, but to say we need to pull out all the stops for such an infinitesimal sector of society is crazy and frankly irresponsible. Lets look at the data another way so as to put it – and the campaign to eradicate the world of all viruses and sicknesses no matter the cost – in perspective. Globally 0.00026% of the population died from H1N1 and when you consider the world’s exponentially mushrooming population as the balance between births and deaths we see that H1N1 deaths were 0.01258% of births worldwide. These are numbers that border on the non-detectable when compared to pressures such as drought, war, famine, AIDS, malaria, etc. Additionally, it is worth noting the US has lost 4,386 men and women in Iraq since the occupation began, with a similar trend evident in Afghanistan. The former is 0.00143% of the US population, which is a greater than those killed by H1N1 in this country. Just a little perspective as I don’t see any fuss being made over the countless bodies arriving in Delaware every week. As a matter of fact former President Bush/Cheney wouldn’t even let pictures be taken of this type of seen. The fact is that H1N1 and the inertia involved in fighting it’s spread lined the pockets of Roche shareholders. The general public writ large was stirred into a frenzy by a convergence of private and public forces for myriad reasons, but undoubtedly the private concerns centered on going long Roche in the weeks leading up to the outbreak and sustaining that momentum to the present day. The data does not lie! What is that famous line “The Plural of anecdote is data”? Well it says here that the data paint an entirely different and markedly less dire picture than tha forwarded by popular media and the Madison Avenue wunderkinds. I am reading Malcolm Gladwell’s “Outliers: The Story of Success” and couldn’t help but recall that the U.S. itself is an outlier. Below I have wrapped up where it is we sit on the outlier gradient across a variety of not so complimentary indices relative to other G8 or G20 nations. 1. 20 sq. ft. of retail space per person Vs 13 for Canadians, 6.5 for Australia, 3 in Sweden (http://www.nytimes.com/2009/06/14/magazine/14FOB-Consumed-t.html?ref=todayspaper). 4. 5% of the world’s population and 25% of the world’s prisoners not to mention along with 3% of the world’s resources while consuming 25% of the world’s $69.70 trillion in GDP. 6. $6,102 spent on Health Care per person in 2004 Vs $3,165 in Canada, 3,150 in France, 3,043 in Germany, and 2,508 in Russia. 7. #29 for infant mortality Vs #3 for Japan, 4 for Sweden, #7 Spain, #9 France, #11 Germany and Italy, # 27 Cuba. Furthermore, we have fallen from #12 in 1960. So there you have it. We are the global outlier on many fronts and will only be allowed to regain the head of the table a/o be taken seriously by the BRIC nations (Brazil, Russia, India, China) when we accept our faults, heavily modify them, and emerge stronger and more cooperative. While we spend so much time focusing on the negative in DC it is worth noting that Senatory Chuck Grassley of Iowa (R) has been spending the past couple of years engaging in a singularly noble effort to open the curtain and reveal the machinations of the medical-, religous-, and academic-industrial complex. While folks may not agree with the senator on other issues the list of achievements below is a credit to his independent nature and ability in the face of mounting pressure from neocons to acknowledge what makes sense and what is just. 1. He has busted open the case of Wyeth and it’s hiring of DesignWrite to publish journal articles that painted Prempro, a hormone replacement therapy, in a favorable light (http://www.nytimes.com/2008/12/13/business/13wyeth.html?scp=1&sq=Wyeth%E2%80%99s%20Use%20of%20Medical%20Ghostwriters%20Questioned&st=cse). These publications have zero authenticity or credibility and Senator Grassley simply discussing them in DC has brought significant, albeit undesired, attention to a practice of ghostwriting that has come to pervade the now opaque boundary between research and industry with respect to drugs and device makers here in the US. The article in The Times cited past ghostwriting disasters like Merck’s painkiller Vioxx and Wyeth’s diet pills Redux (Ironic!) and Pondimin. In responding to evidence that she was herself a ghostwriter Dr. Lila E. Nachtigall the director of NYU’s Women’s Wellness Center said “It kind of makes me laugh that with what goes on in the Senate, the senator’s worried that something’s ghostwritten. I mean, give me a break.” HOW BOUT you give us a break Dr. Nightingale and realize that if you did do what the evidence suggests you did than that is a crime and you definetely don’t deserve to associate yourself with a Women’s Wellness Center. Oh yeah and what is more important than medical transparency? Exactly! 2. Most recently the senior Senator from Iowa has announced an investigation of Dr. Timothy R. Kuklo (the Dr. used loosely here!) who falsified a study on a bone-growth product called Infuse, made by Medtronic, in studies of war vets at Walter Reed that “…had suffered sever lower leg injuries in Iraq.” Additionally, this fantastic character forged the the names of four co-authors, with the publishing journal retracting the paper in question immediately. Kuklo is now teaching at Washington University in St. Louis. When asked about the issue Col. Norvell V, Coots the head of the Walter Reed Health Care System stated “My guess is we will probably find something more here,” I would hope so and I think with Senator’s Grassley’ propensity to push such issues we will see results and open repudiation in the medical field (http://www.nytimes.com/2009/05/19/business/19surgeon.html?scp=1&sq=Senator%20Seeks%20Data%20on%20Doctor%20Accused%20by%20Army%20of%20Falsifying%20a%20Product%20Study&st=cse; http://www.nytimes.com/2009/05/13/business/13surgeon.html?scp=1&sq=Doctor%20Falsified%20Study%20on%20Injured%20G.I.%E2%80%99s,%20Army%20Says%20&st=cse). 3. He was indirectly instrumental in convincing the Cleveland Clinic to fully disclose it’s doctors’ and researchers’ ties to drug and device makers a huge step for one of the leading medicial institutions in the US if not worldwide. 6. The good Senator has most likely risked within party political capital by seizing on the predatory tendencies of certain ministry that rely on what is referred to as “prosperity gospel”, which “…assures followers that the more they give, including in the form of tithes to the church, the more they will receive from God. Some prosperity gospel preachers live lavishly, as proof of the abundance God can bring.” (http://www.nytimes.com/2007/12/24/us/24church.html?scp=1&sq=Senator%20Awaiting%20Records%20of%20Ministries%E2%80%99%20Finances&st=cse) These “Houses of God” turn around and continue to flout their tax exempt status even though what they are preaching and asking of their flock is by no means Holy and could be easily interpreted as criminal. 7. Defending utility of whistle-blowers in the face of intense pressure from within his own party. Senators Grassley and Leahy (D) of Vermont recently came to the defense of Sibel Edmonds and former FBI translator who called out systemic failures in the Bureau related to “…sale of nuclear secrets, shielding of terrorist suspects, illegal arms transfers, narcotics trafficking, money laundering, espionage. She may be a first-rate fabulist, but Ms. Edmonds’ account is full of dates, places and names.” (http://www.dallasnews.com/sharedcontent/dws/dn/opinion/points/stories/DN-sibeledmonds_17edi.ART.State.Edition1.45b446a.html) Ms. Edmonds was instead of being heralded for attempting to open dialogue immediately marginalized by then Attorny General John Ashcroft (http://query.nytimes.com/gst/fullpage.html?res=9905E4D61438F936A25752C0A9639C8B63).